Juan Carlos, prepares an asado. 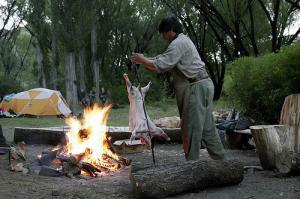 In Argentina, an asado is not just a way of cooking meat; it is an art form. Every chef has his own personal secret when it comes to arming the parrilla (grill), whether it is the heat of the fire, the ratio of coal to wood, or at what moment they turn the meat on its back. Grilled meat is part of the Argentine national identity, infinitely associated with the romanticism of the Pampa region and the wanderlust of the gaucho. Whether the individual comes from Córdoba, the Province of Santa Cruz, or the banks of the Rio de la Plata, Argentines are born knowing how to make asados. The tradition dates back to an era when gauchos, or cowboys, roamed the interior Pampa region and lived entirely off the land and their stock. Many of the gauchos were of Italian descent, and they brought those cooking traditions with them to the kitchen when preparing meat. Their cow-centric livelihood created a need to be resourceful and thorough- and they let no part of the animal go to waste. The asado tradition continues to this day, and there are many regional variations throughout the country. Whatever you do in Argentina, do not miss out on an asado. Not only are you failing to engage in one of the most delicious meals of your life, but you are not experiencing an important aspect of Argentine culture. This page rendered in 0.364 seconds.